Filming started April 25th on director Kim Jee-woon's Oriental western adventure "The Good, the Bad, the Weird". The film will showcase an ensemble of stars in the central roles with Lee Byung-hun, ("the good"), Jung Woo-sung ("the bad") and Song Kang-ho ("the weird"). The film is set in Japanese-occupied Manchuria during the 1930's. It will mark the first time the top three Korean stars have acted together. Director KIM, in an interview with the Chosun Ilbo, described his experience of handling the needs of the three celebrities. KIM called LEE the "most particular actor in Korea" – the one most often asking questions about his role. SONG, he called "Korea's super-actor" and JEONG, the actor "ambitious to be director". The film tells the story of three Chosun dynasty horse-riding bandits who discover a treasure map and are pursued by an army of national independence soldiers who believe it is a map of Japanese plans to build a railway. Obvious inspiration came from Sergio Leone classic, The Good, the Bad, and the Ugly but KIM insists this western will be of a distinctly Korean flavor. The main production will be filmed on location in China over six months with additional shooting in Korea and Hollywood. A release date is expected by summer 2008. 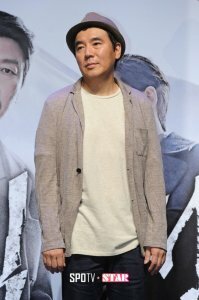 A press conference was held on Monday at Yongsan CGV theaters for Ken Watanabe, the star of the film "Memories of Tomorrow". It was his first visit to Korea. While it's not uncommon for foreign actors to come to Korea to promote their movies, Ken's visit was impressive in two ways.